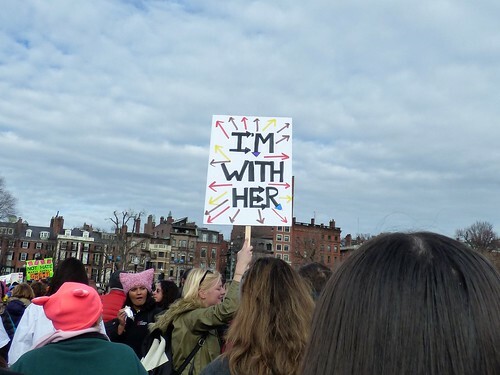 On Saturday, J and I took the T downtown, where we converged on Boston Common with some 175,000 other folks for the Boston Women’s March. I knew tens of thousands of people had registered, but it was clear the turnout would be larger than expected when we arrived at our local T station more than an hour before the march and saw a crowd of pink-hatted women, men, and children waiting for the second of two back-to-back, already-full trolleys. At each stop, some people on the platforms would shake their heads, determined to wait for the next, presumably less-packed train…but at each stop, a brave handful would squeeze into the train, and the rest of us would jostle closer to our neighbors, making as much room as possible. I’m not a fan of crowds, which sometimes make me claustrophobic. 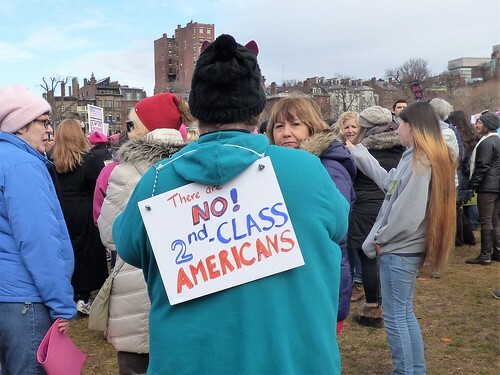 But the massive swell of pink-hatted protesters on Boston Common on Saturday didn’t feel like a crowd: instead, it felt warm and safe, like a hug or a snug blanket. It was a press of friendly flesh where we all quite literally had one another’s backs as we listened for nearly two hours to speeches by Boston Mayor Marty Walsh, Massachusetts Senators Elizabeth Warren and Ed Markey, local labor leaders, civil rights activists, clergy, and local schoolchildren. One of the questions frequently asked of this weekend’s marchers, particularly by Trump supporters, is why are you marching? 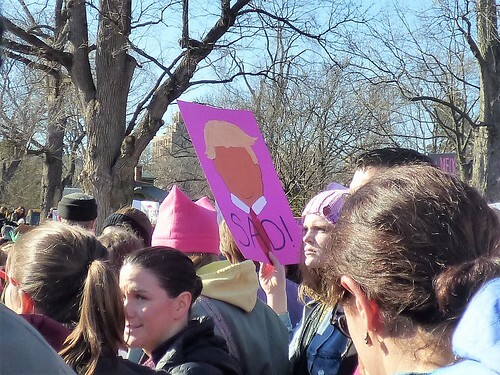 Why march against a President who has just taken office and hasn’t yet had time to implement any policies: why not wait and give him a chance? I have a very simple answer to this question. Trump, his administration, and the Republican Congress will have a chance to implement their policies whether I like it or not. But even though I didn’t elect the man driving this particular train, I marched on Saturday because I recognize humans are social creatures, and in a democracy we are bound together by a social contract. 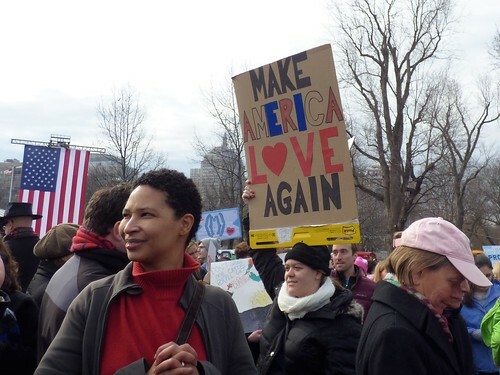 After a campaign where our civil unity was stretched to tatters, I marched on Saturday to affirm one simple truth: regardless of who is in the White House, we citizens here on the ground need to have one another’s backs. 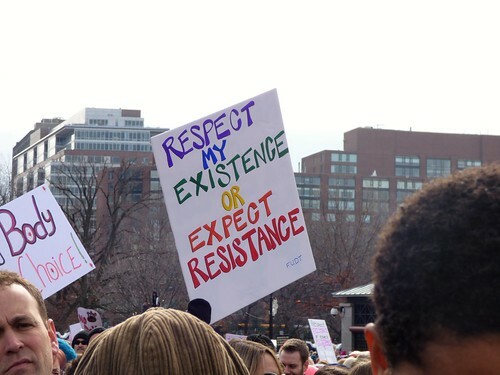 As a white woman, I marched to affirm black lives. 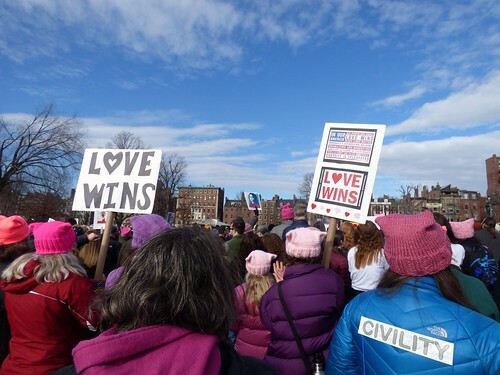 As a straight woman, I marched to affirm LGBT rights. 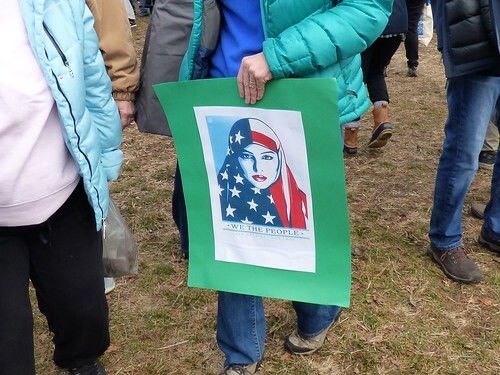 As a United States citizen, I marched to affirm the rights of immigrants and their families. As a Christian, I marched to affirm the civil liberties of Muslims, Jews, and other targets of post-election hate crimes. 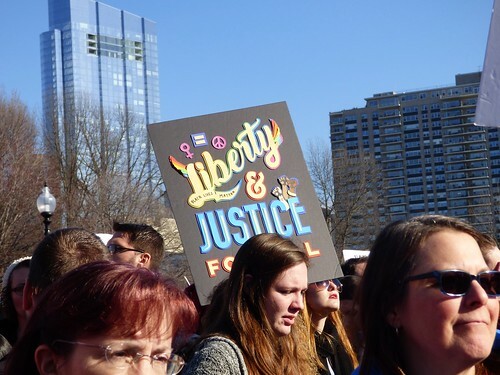 And as a woman, I marched to affirm that women’s rights are human rights, every person deserves affordable health care, and every woman has the right to decide what happens to her own body. 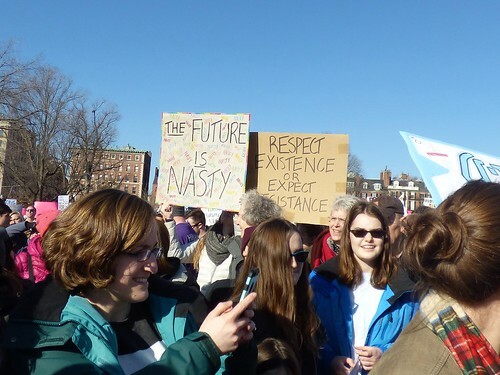 But even though J and I didn’t actually march at Saturday’s March, it was enough to have been there. It was awesome to be subsumed by a crowd of peaceful protestors. 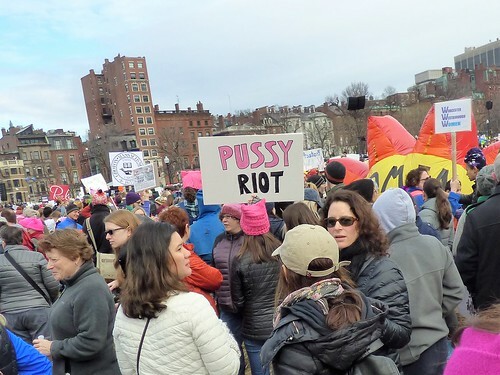 It was inspiring to surge on a sea of positive energy even though we were collectively protesting an election that was an affront to our shared values. 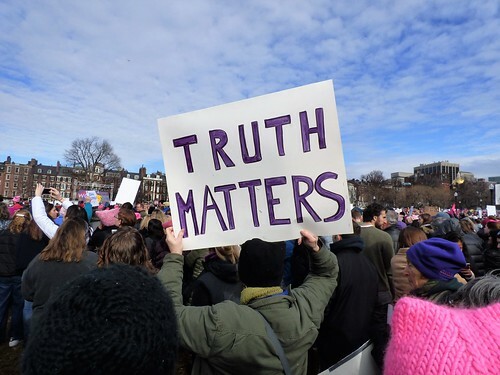 And it was encouraging to affirm what we believe is the bedrock of our American democracy: rights and dignity for all, and promises based on facts, evidence, and reality. Instead of moving our feet, J and I took a stand, and I’m immensely glad we did. Watching news coverage of marches in DC and around the world makes me realize the awesome power of millions of people who’ve got one another’s backs. 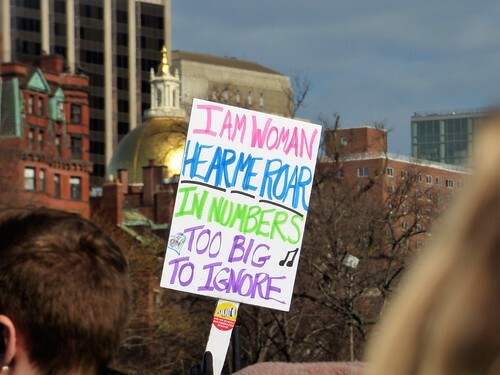 Click here for more photos from Saturday’s Boston Women’s March. Enjoy! Happy to hear you marched. My wife and made to the march here in San Jose – had a similar experience on the train. Way more people showed up than planed. Thank you for taking me there with your words. In solidarity for democracy. Trump is divisive, disgusting, disgraceful and a sociopath of immense proportions. God help Americans and the world.